This new medium size, high class, register free day cruiser, designed foe a young market, was introduced with great pomp at the last Genova Boat Show. The boat's LOA including the stern platform is just 5 centimeters above the eight meters: a size more than sufficient to create a real living craft without having to sacrifice the high standard and comfort typical of this northern Italy boat yard. Although the eye is clearly set at the young users market perhaps at their first sea experience, the 75 Dorado is the result of the sterling boat building experience that this yard has proudly gained in the field of larger crafts and put to full display in this smaller model. We tested her at Portovenere, in the Poets' Gulf on a day with strong south westerly wind and have discovered that in many aspects she is the Italian answer to the strong competition in this market segment and especially the one of the US origin. Fitted with a single propulsion plant, the most powerful among the available alternatives (a 275 HP Volvo Penta), the boat has achieved and passed the 40 knots with six passengers in the sheltered waters between Palmaria island and La Spezia Gulf coast. In spite of the adverse weather conditions we risked a run in open waters where a two meters plus swell was experienced: the entire hull structure as well the test pilot experience was severely tested. Result: an A plus! Standard equipment: 42 liters refrigerator, electric windlass with 25 meters of chain, engine monitoring instruments and gauges, aft sun bathing area, cockpit table, fore hatch, swimming ladder, cockpit teak deck. Optional: additional battery, complete canvas, sun canvas, depth sounder, log, automatic fire extinguisher, cradle, painted boat's name, antifouling, stereo plant, radar arch, VHF. wind: 2 m/sec - sea state: moderate swell. Construction material and detailing: hand layered reinforced fiber glass; deck reinforced with balsa wood and frames. Stainless steel deck grabrail. Large swimming platform, with excellent design. Windshield. Lockers number and place: 4 in the cockpit, 1 at the bow, several under deck. Deck: large cockpit with sunbathing area and convertible dinette. Teak lined cockpit sole. Access door to the swimming platform. Side lockers. Bow hatch. Stainless steel deck hardware. 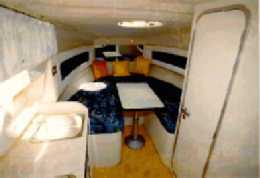 Interiors: spacious bow cabin with dinette convertible into a double bed. Galley area to the port side in front of the separated bathroom. 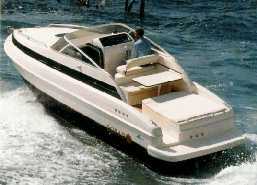 Aft cabin for two persons. Steering comfort: the steering station is placed to the starboard side and feature a modern design with complete engine monitoring instruments and gauges set, navigational instruments, throttle and double pilot seat.